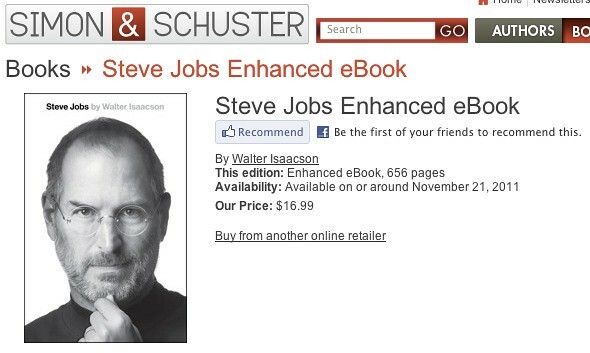 As noted by SetteB.it, the Steve Jobs bio “Enhanced eBook” is now set by Simon and Shuster at 656 pages. That’s over 200 additional pages more than the previous page count which may have been a very low estimate. Recently, Walter Isaacson said that Jobs’ resignation would be added to the book, but it seems like a stretch that that chapter would add 50% more content. Also, the publication date has move from November 21st, to “on or around November 21st”, signaling that there may be some movement in the release date. You can pre-order the book at Amazon or on Apple’s iBookStore where it still is listed at 448 pages.